Powdery mildew of apple is caused by the fungus Podosphaera leucotricha, a different species from the one that causes powdery mildew on cherry (Podosphaera clandestina). 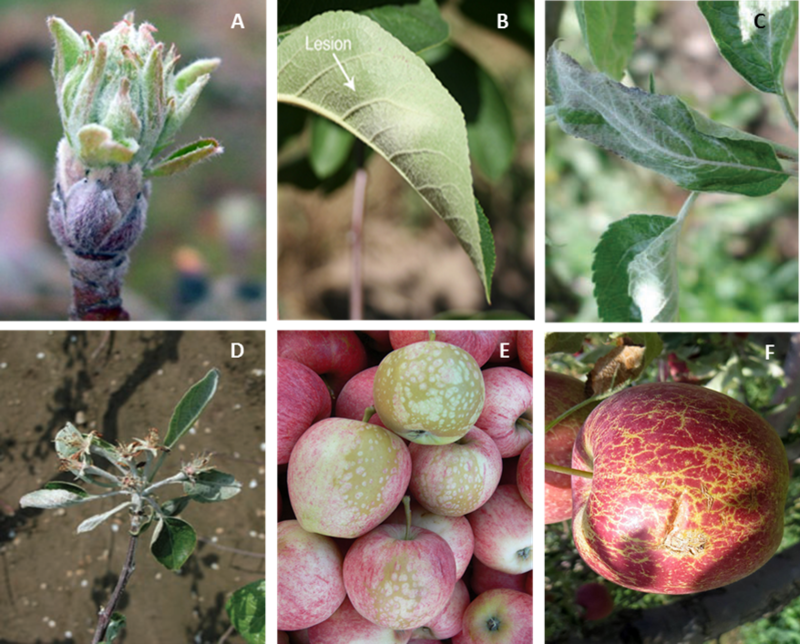 Powdery mildew of apple overwinters in buds infected during the previous season and when weather conditions become favorable in the following spring, malformed shoots (Figure 1A) emerge from infected buds. The fungus produces new spores that can be spread by wind to initiate new infections on blossoms, leaves and especially new shoots (Figure 1D). Powdery mildew can negatively impact photosynthesis, shoot growth, and reduce fruit set. The fungus causes whitish fuzzy lesions (Figure 1B,C) and causes leaves to curl (Figure 1C,D). Under high disease pressure, the fungus can cause the fruit to russet (Figure 1E,F). Figure 1. Symptoms of powdery mildew (Podosphaera leucotricha) on (A) bud opening (Green tip), (B) lower and (C) upper (notice leave curling) faces of leaves, (D) a shoot fully covered with whitish mycelium, (E) early and (F) sever signs of fruit russeting due to powdery mildew. The two most important factors for powdery mildew infections are temperature and cultivar susceptibility. The mild and dry weather conditions that are common during spring and early summer in the Pacific North West (PNW) can be very conducive as wetness is not required for infections to starts. Temperatures between 66°F and 71°F are optimal for infections to occur, whereas temperatures below 50°F or above 86°F considerably slow down powdery mildew infections. Cultivar susceptibility is a key factor to consider when implementing a spray program to control powdery mildew in apple. Three cultivars, including Granny Smith, Pink Lady (Cripps Pink), and Honeycrisp, are either highly susceptible or susceptible to powdery mildew infections (Table 1). It is important to mention that organic Honeycrisp and Granny Smith have topped Red Delicious in term of acreage since 2013 which can make powdery mildew management challenging organically, especially under high disease pressure. Among the three main cultivars grown conventionally in the PNW, Fuji is the most resistant whereas Red Delicious and Gala are moderately resistant to powdery mildew (Table 1). In all cases, it is important to remember that resistance is not equivalent of immunity. HS = Highly susceptible; H = Susceptible, MR = Moderately resistant; R = Resistant. Powdery mildew management should begin at tight cluster stage, when buds start to open and release the overwintering inoculum, and continue throughout the third cover spray in early summer. At this time of the year, most shoots have already stopped growing and temperatures in central Washington become unfavorable for powdery mildew. Fungicides from several chemical groups are registered to control powdery mildew and other diseases in apple (Table 2). Although risks of fungicide resistance development may be lower in the PNW compared to other apple growing regions where scab and other summer diseases can be a problem, rotation and tank-mixing of fungicides with different modes of action is highly recommended to lower the risk of selecting for resistant populations. 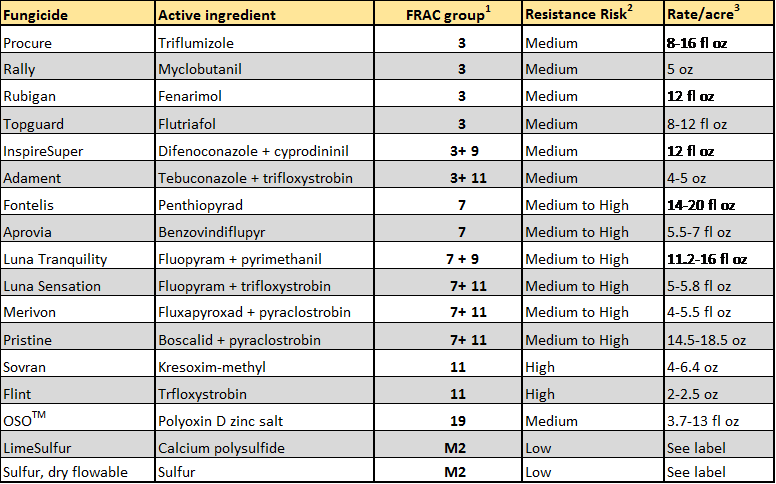 Fungicides from FRAC Group 3 (known as DMI: demethylation inhibitors) are highly effective against powdery mildew and have a medium risk for resistance development. The DMIs should be preferred over fungicides from Groups 7 and 11 in early season to limit selection of resistant populations in other fungi such as gray mold (Botrytis cinerea) and other preharvest and storage rots against which Group 7 fungicides have a better activity than the DMIs. Pristine and Merivon are widely used in the last few weeks prior to harvest to control storage rots. Their usage in spring and mid-summer should be avoided to limit resistance development in storage rots. Another relatively low risk fungicide and a good candidate to rotate with fungicides from Group 3 is Polyoxin D (OSO) which showed a good efficacy in recent research trials. Table 2. Fungicides registered to control powdery mildew on apple. 1) Same number indicate fungicide from the same chemical group (same mode of action). Rotate with fungicides from different FRAC groups. 2) Risk estimated based on the specific mode of action and maximum number of applications indicated on the label. 3) Check the label for rates and specific timing of application. Susceptible cultivars such as Granny Smith, Cripps Pink, Honeycrisp and Golden Delicious make for almost 50% of the total organic acreage in Washington. Therefore, enhanced disease management programs should be implemented. Beside sanitation practices such the removal of infected shoots to reduce the inoculum size in early spring, sulfur is widely used to control powdery mildew in organic orchards. 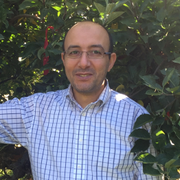 In addition to potential phytotoxicity, especially when temperature above 80°F occur in orchards, sulfur may not effectively control the disease under high disease pressure conditions. Other bio-pesticides to control powdery mildew organically exist (Table 3). Preventive applications and rotations of the different bio-pesticides from tight cluster to third cover spray should help keep powdery mildew under the economic threshold. Finally, observe precaution when growing moderately resistant cultivars such as Gala, which is widely grown organically in Washington, next to highly susceptible cultivars because inoculum drift between blocks can increase the pressure in block planted to moderately resistant cultivars. Table 3. Fungicides registered to control powdery mildew in organic apple orchards. 1) Check the labels for rates and specific timing of application. No endorsement is intended for products mentioned, nor is lack of endorsement meant for products not mentioned. The author and Washington State University assume no liability resulting from the use of pesticide applications detailed in this report.